Concept for a solar border wall. Paul Mirocha. Gary, tell me about this idea for a solar border. How did that first come up? Gary Nabhan: Well, this idea emerged out of dialogue between American and Mexican scholars and activists, hoping that we could see an installation along the border that unites and bridges us, rather than divides us…. If we could provide a positive alternative along the border that created renewable energy … and protected the border by having communities with livable wages in them, I think we would be dealing with the underlying causes that create tensions between our countries, and the current wall proposals do not do that at all. Describe to me what you think this installation could look like. Gary Nabhan: What’s proposed at this point is three tiers of solar photovoltaic panels that could be linked to grid systems, substations, and generate energy that goes into many other areas…. 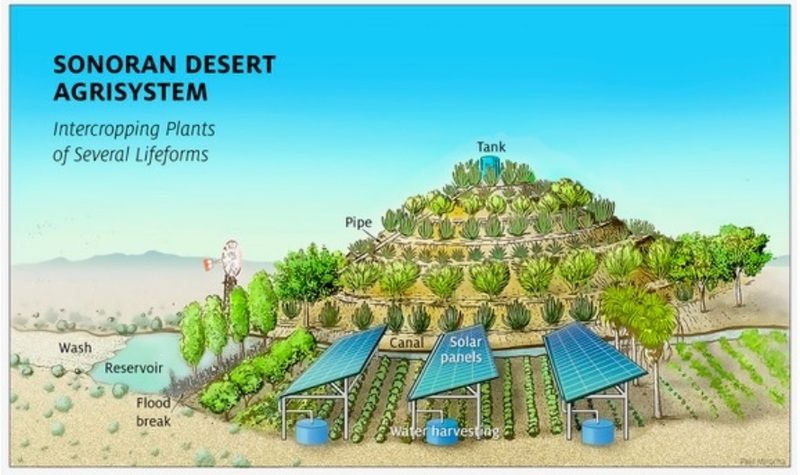 The solar collectors could be designed in a way where all the rainfall off them is caught and stored, underground or in barrels, that could then be pumped onto plants, either for food and medicine for local communities, or for wildlife, because we have a lot of endangered wildlife in the border area. Gary is the structure you’re describing something that would actually stop people from crossing illegally—or is that not even really the goal with this concept? Gary Nabhan: People are getting over, under and around the walls as they occur now. Again we have to deal with the underlying causes, and those have to do with the poverty and disparity. If we have healthy communities that are proud of what they’re doing and watching out, the amount of negative activity along the border will decline…. We could be creating jobs along the border, harvesting healthy food, and those are some of the underlying causes for both immigration and for people in desperation turning to higher paying jobs in the narcotics trade rather than being farmers or ranchers or foresters like they were before. Has anyone run up those numbers about how much this solar installation would cost up front? Gary Nabhan: It would cost no more than a sixth of what the lowest of Trump’s finalists would cost. It would generate income and pay for itself within seven years. A steel wall or a concrete wall cannot possibly do that. As you’ve given talks about this concept, how have people responded to you? Gary Nabhan: I’ve given talks in Mexico and the U.S. on this, and met with indigenous leaders, and they know that they’re against the wall, but just saying no isn’t enough, they need a positive alternative. And I think they’re very, very hopeful. The first time I’ve ever gotten a talk interrupted, of all the talks I’ve ever given in Mexico, was last week in Coahuila, saying just what I said to you, that we need an installation there that unites us rather than divides us. And I got a standing ovation. It’s not because of me, it’s because people so desperately want the relationships between our two countries to improve and to have a solution that unites us. Thanks for speaking with me, I appreciate it. My best to you, thanks again. 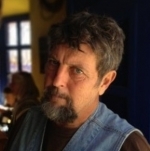 Gary Paul Nabhan is endowed chair in Borderlands Food and Water Security at the University of Arizona. 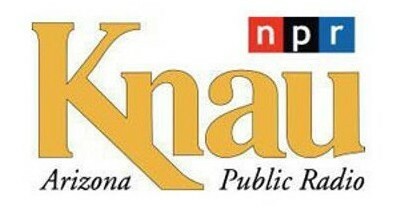 He was the former director of the Center for Sustainable Environments at Northern Arizona University.